We are home now from our grand adventure, but on our last day we did end up getting 3 native American flutes. After spending some time at the Casa Grande Ruins the day before playing our flutes, we discovered that they also sold flutes in the gift shop. Not only that but they were High Spirit flutes like the ones we had only in different keys. They had one that was in the key of F# that was a signature flute. Meaning that it is a limited edition flute and there is only 100 made of each design. They had a flute guard to blow in so we were able to try it out and both Rob and I loved the sound, but… we left it there. Returning to the hotel, I looked up the High Spirit Flutes website and Rob asked me how far it was to drive there. Looking at the map it said 2 hours and 15 minutes but as we were leaving the next day I never thought too much about it again. The next day by 10 am we had all out bags together and stowed them in the car and Rob said lets head down to Patagonia. I’m looking at the clock as we are supposed to hand in the car at 4 pm but what the heck… We could do it!! Now, normally this drive takes us two days to get to Patagonia what with stops for meals, bird watching and sightseeing. This time we took the direct route and after Tucson stayed on Highway 10 and took 83/82 highway. We had never been down 83 before and the scenery was rolling hills and dried grass. I was looking for Pronghorn Antelope as we had seen them around Sonoita before but instead saw a couple of ravens flying around and dropping down into the tall grass. 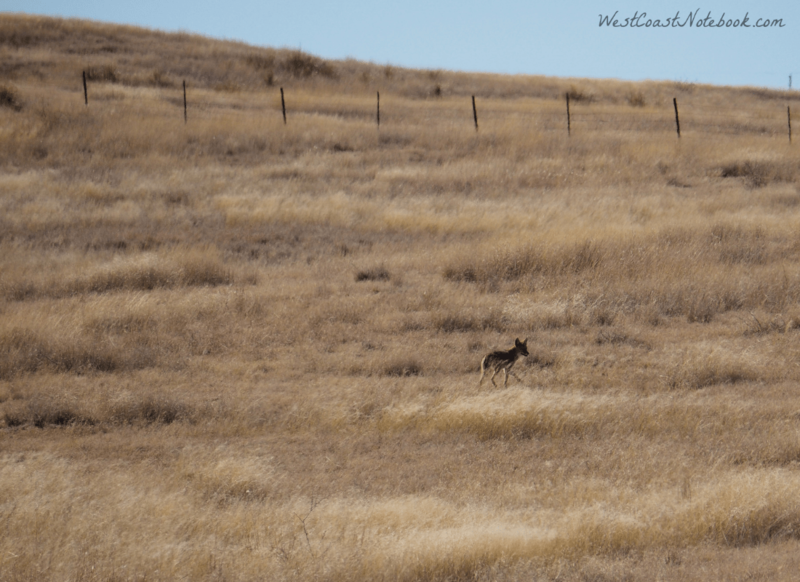 As we drove by something caught my eye and I said… “there’s a coyote in the field as well”. By the time we turned around it had headed up onto a hill and although we were quite a ways away from it, it kept trotting on and looking at us over its shoulder. Arriving in Patagonia we found our way easily to the High Spirit shop and spent some time trying out all the flutes. I found out that the ones that I liked the looks of, didn’t always feel right or have the tone I wanted. Their website does a great job of giving you examples of the tone and pitch of the flutes, but for me, I really needed hands on. Rob wasn’t as picky as I was, and he soon settled on two new flutes. 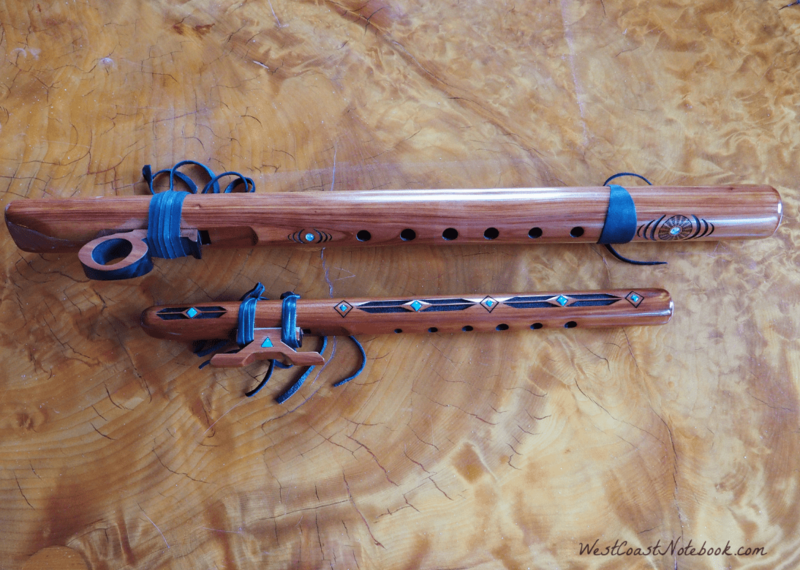 One was a Condor Bass, Key of E in Aromatic Cedar and the other was a Pocket Flute, Key of G in Aromatic Cedar. If you click on the link above for the Condor Bass, Key of E you will actually be able to hear what the flute sounds like as Odell Borg (the owner) plays as short melody. 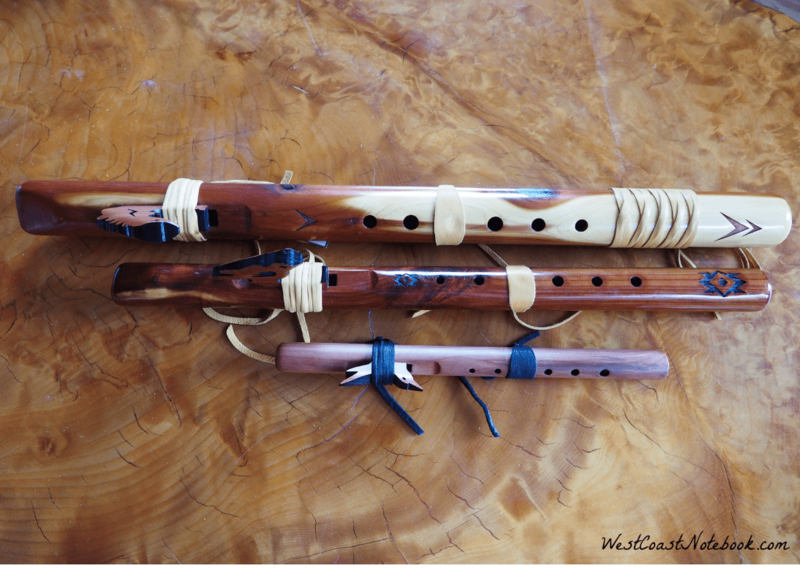 The flute that Rob already had that he bought in Montezuma Castle after listening to Harry Seavey’s music echo through the ruins was a Sparrow Hawk – key of A in Aromatic Cedar. I have to say that I love the little pocket flute. It’s so easy to play and has a clear crisp voice. Also, and I know this sounds weird, but if you hold the end up to your nose the most wonderful smell emanates from it. It smells like walking through a cedar grove on a hot, hot summers day so it supplies one with touch, feel, sounds and smell. Delicious combination. As I mentioned before I spent a little more time trying out the flutes in the store. Starting first with the ones I thought were the prettiest and finally narrowing it down to ones I liked the sound of and that I could play. Not play as in making a sound but actually play as some of them were a little too long for my arms and for my fingers to cover the holes completely. I walked over to the display where they have the EarthTone 432 Hz flutes. Now I noticed that this type of flute was copyrighted on their webpage so hopefully I’m not infringing on their copyright by mentioning it here. But as soon as I picked up one of the flutes and played it I could feel the resonates of it. It felt like it was sending ripples of sound throughout my body and I knew that was the one. 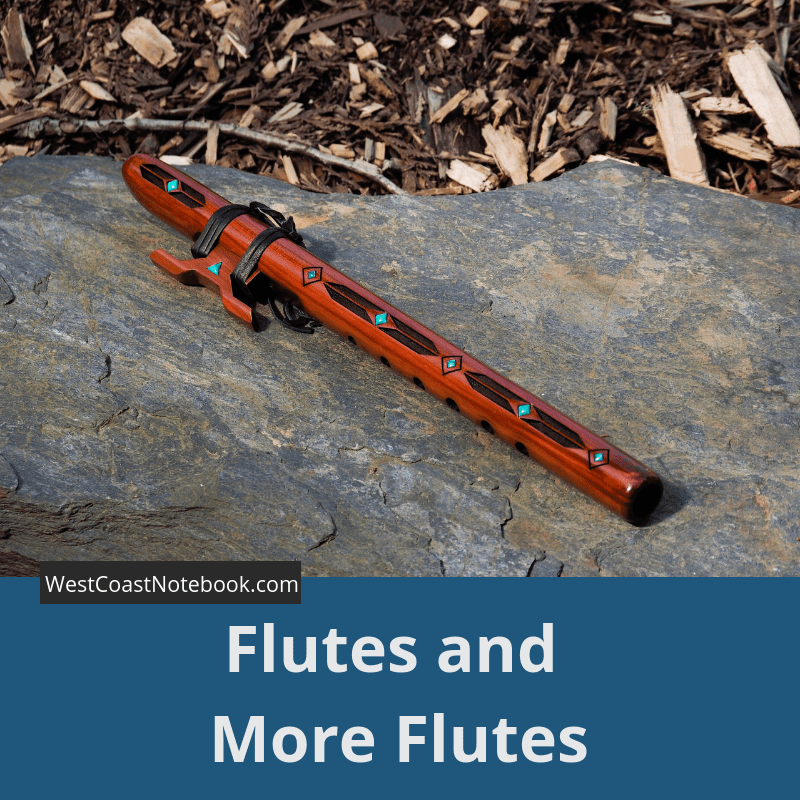 If you click on the link above you will get the reason why these flutes are different than the regular flutes but I like the fact that this frequency most closely resembles the vibration of nature. I also ended up getting it in the key of E in aromatic cedar and you can hear what it sounds like here. It looks like the leather is blue, but that’s just the lighting. The leather is all black. The staff were extremely helpful and we were happy as we had arrived when they were having their holiday sale. One of the pleasures of the trip was that we got to met Odell who was just finishing up with a meeting. After watching him play on the website and getting their newsletter every month (which you can sign up for here) it felt like we already knew him, so it was great to see him in person. Remember the money we won at the casino? Well, instead of keeping it for the next trip, we indulged and bought ourselves flutes. Nice return on investment and full of enjoyment. There were a few incidents before we arrived at the car rental return. Things like… have we already passed it and should we turn off here. But we found the right exit and were only about an hour late in returning the car. There was a little incident at the airport at security with bringing a bottle back from Mexico that hadn’t been properly tagged by the Mexican duty-free and Rob, if he wanted to keep the bottle had to end up checking his bag. He was gone for the longest time as I waited in security and it turns out he had to pay $30 dollars to get his bag on board the plane. The plane was late in getting away and we only had a window of 35 minutes at the best of time to get to our next plane in Seattle. Usually, it requires us to take the shuttle to another part of the airport and we were beginning to wonder if they would wait for us. But the gods were with us and the plane was already boarding at the gate right next to the one we go off of. Turns out it was a good thing that Rob checked his bag as that allowed him to carry the flutes onboard in a box that High Spirit Flutes has so graciously wrapped up our purchases with bubble wrap in between them. The rest of the trip went smoothly and a friend picked us up at the airport. Nice to sleep in one’s own bed again. And so ends our trip to Mexico, California and Arizona. I wonder where our next trips will take us? DIY – How To Keep Hummingbird Feeders From Freezing! Want to have an email notification land in your inbox after I publish a post? Submit your email address below to make it happen! Most of the pictures on this website have been taken by me and you are free to share them on Facebook, Pinterest or other social media as long as you give a link back to this website. That way, we can both be in integrity with the copyright. Don’t Plant Winter Rye Until You Read This! Copyright text 2019 by West Coast Notebook All rights reserved.